Although his team did not win the World Series, New York Mets infielder Daniel Murphy was certainly a star in the just-completed MLB playoffs. 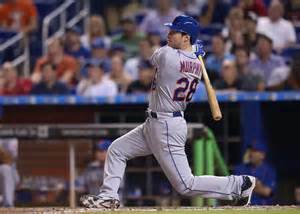 Murphy, who has 62 career home runs in more than 900 games in his seven-year stint with the Mets, slugged seven home runs in the 2015 post-season, finishing one shy of tying the MLB record of eight held by Carlos Beltran, Barry Bonds and Nelson Cruz. Murphy wasn’t the only player to go on a home run binge in this year’s playoffs. Cubs’ rookie Kyle Schwarber had five home runs in this year’s post-season. What makes Murphy’s feat in the 2015 playoffs all the more interesting is that during the 2015 regular season he hit only 14 long balls in 130 games (his seven post-season homers came in 14 playoff games, although he went homer-less in the World Series). Of the 20 players who have hit six or more home runs in a post-season year, Murphy’s 14 HRs in the regular season is the third lowest of the 20 players. Melvin Upton in 2008 had seven home runs for the Tampa Bay Rays in their 2008 post-season run, but during the regular season Upton had only nine long balls. Following is a look at the 20 players who had six or more HRs in a post-season year and the number of home runs they hit in the regular season that season.